Djembe Rope. Why Quality Matters. When shopping for a djembe drum it's important to know the type of rope used. Due to the high tension that are put on the ropes it's essential that your djembe drum has good quality rope that is quite thick and also low stretch. 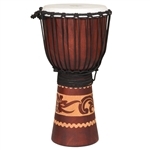 Top end djembes are typically strung with 5mm thick ropes for extra durability and performance enhancement. 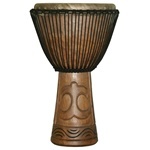 X8 Drum Djembes use high performance, low stretch Alpine rope on all of our custom djembe drums. 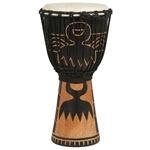 To help you make a better buying decision we've put together this rope guide that lists out the specifications on all series of X8 djembe drums. ** Both HTB and PP are low stretch Alpine Nylon rope, however HTB is a better quality rope than PP. 12. Djembe Rope. Why Quality Matters. 16. Play the Djembe is Easy for All!